Tom Coffin is the Visualization and Operations Manager at the Emerging Analytics Center (EAC). 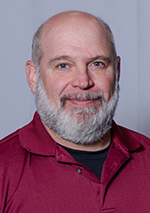 He is a Fine Artist (MFA) and Certified Project Manager (PMP), Tom brings over 2 decades of experience working with virtual reality application development and advanced collaborative environments and 3 decades of project management to the EAC. Prior to the EAC, Tom worked at the National Center for Supercomputing Applications (NCSA) in the University of Illinois where he managed the programmatic and technical operations of the ACCESS facility in Washington DC. Tom is a graduate of the Electronic Visualization Laboratory at the University of Illinois at Chicago where he assisted the University with the commercialization of the CAVE technology into the private sector.